Domaine Georges Vernay lies at the heart of Condrieu both literaly and figuratively. With just over 7 hectares in the original appellation, Geoges Vernay and his father played key roles in the creation and survival of Condrieu. The heritage of the Condrieu appellation is hard to surpass. Evidence exists that point to the perfumed, floral whites of these granite hillsides being made as far back as the 3rd century A.D. By the fourteenth century, the wines were being shipped down the river to the Papal Palace in Avignon, and by the early 1700s the wines had found their way into the cellars of English royalty. 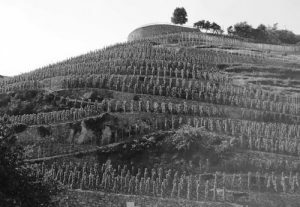 In 1940, the appellation was officially created thanks in large part to the help and efforts of Francis Vernay. In later years, his son George would play a key role in restricting the geographical boundaries of Condrieu to include only the best hillside vineyards, even robbing himself of the appellation for some of his vineyards on the plateau above. Domaine Georges Vernay came to be regarded as one of the reference standards in Condrieu for decades with Geor ge at the helm, but when he retired in the early 1990s there was uncertainty as to this famous domaine’s future. Finally, after a few years adrift, George’s daughter Christine returned home in 1997 to assume control and under her the domaine has flourished even more. 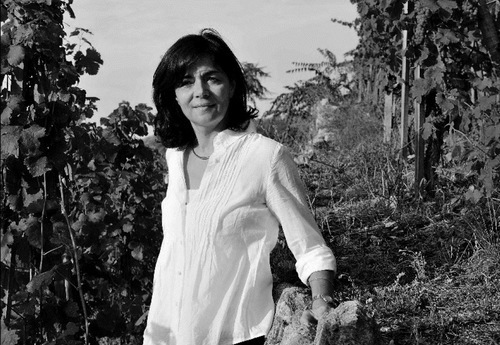 She has brought an even greater level of refinement to the wines and has also brought more focus on the estate’s reds bringing them up to a world class level. The domaine now consists of a range of wines from Vin de Pays to Condrieu and Côte‐Rôtie. All the vineyards are farmed organically and all vineyard work is carried out by hand. There are two Syrah cuvées as well as a Viognier made from vines on the plateau above Condrieu which all carry the Vin de Pays des Collines Rhodaniennes appellation. There is a Côtes‐du‐Rhône from the Sainte Agathe vineyard in Condrieu that is 100% Syrah and a Saint Joseph from the northern commune of Chavanay. In Côte‐Rôtie there are two bottlings, the first from old Syrah plantings in the Maison Rouge vineyard, and the second a blend of Syrah and 5% Viognier called Blonde du Seigneur from the Lancement and Côteaux de Semons sites. In Condrieu, there are three cuvées; Terrasses de L’Empire, Chaillées de L’Enfer, and the famous Côteau de Vernon.